The ladies at the front desk were extremely courteous and helpful, explaining everything thoroughly. They were great when we requested recommendations or suggestions for dinner. We thoroughly enjoyed our stay! The property is extremely well maintained and clean! All the staff we had any association with were very nice and courteous. Love the fact that we were right next to the pier!!! 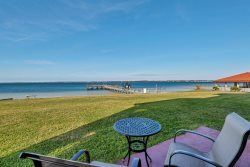 We will definitely look at this property again when planning our next trip to beautiful Navarre Beach. Staff was very attentive to needs. We had a great stay and will make this property a favorite on our vacation list. Navarre Properties staff is incredible! Petra was wonderful! She made booking our reservation a breeze. Todd with the front desk was full of useful information about Navarre and it's surrounding areas. Megan with Housekeeping was able to make sure our unit was inspected before our arrival! I couldn't find a thing wrong! The maintenance men, John and Brian, were amazing when we needed maintenance. Even Laurie, the owner, came down to the wedding and congratulated us! I couldn't have asked for a better weekend! Cabana del was the perfect place for our soundside wedding! It is spacious and still has that small wedding feel about it. My husband and I both love this house! We're probably going to make coming back an annual thing!